On Friday my old friend Sid called. He was going to make a presentation to a bunch of sales guys about Mutual funds and he was looking for a suitable template. If you type 'free powerpoint templates' you will get 5.92 million results on Google and 6.09 million on Bing. But searching on Google might take some time. That's because you are looking for a specific template. In such cases, all you need to do is prioritise. What you should do is find out 2 or 3 good websites which provide free templates. Then go and search these sites instead of wandering around on Google. 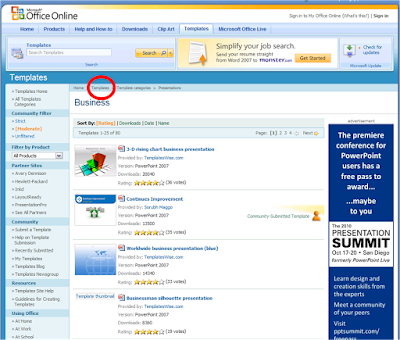 On of my favourite sites to download PowerPoint templates has been 'MS Office Online'. I used to use this site back in college days. In the last few years I have never downloaded a template. There are two ways to visit the site. You can bookmark the URL and access from your browser. If you forget the URL you need not worry. The link is part of MS PowerPoint. 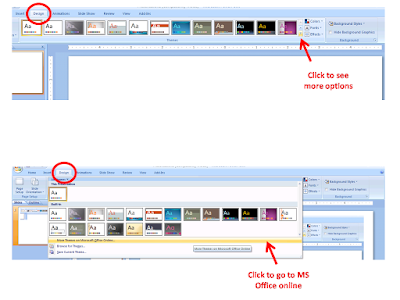 Open a presentation -> Go to Design tab -> Click on down arrow to open the Themes -> Click on More Themes on Microsoft Office Online -> Click on Template categories (in the website) -> Choose PowerPoint. The process is almost similar in Office 2003. You can go the templates page directly by clicking here. There are 9 categories under which templates have been classified. There are 62 templates under Academic and 80 under Business. Though by no means exhaustive I still feel the site has a good collection of templates. There is another site i know that had a large selection of really good temaplates that are very business focused they also give away free templates aswell. Thanks Beckie for the link. There are plenty of modern presentation sites for free PowerPoint templates. I do agree with you that running this query on Google will bring plenty of results but filtering from a few of these sites can help to optimize the time. Slideshop offers a wide variety for different types of PowerPoint presentation templates for free! Yep,surely you're going to face 6 million variants of template websites, but I want to offer you The Special One - http://www.poweredtemplate.com/,where you'll face the best templates through the web! Try this and you won't be disappointed!